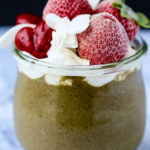 This Strawberry Beauty Greens Smoothie with Gelatin Hearts is nourishing and delicious. It’s filled with micronutrients and greens for beautiful skin, plus gelatin hearts to support gut health, too. 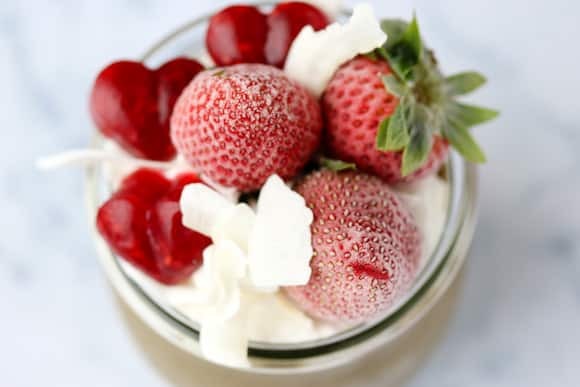 Strawberries almost always seem to be in season here in California, but you can use either fresh or frozen strawberries for this recipe. 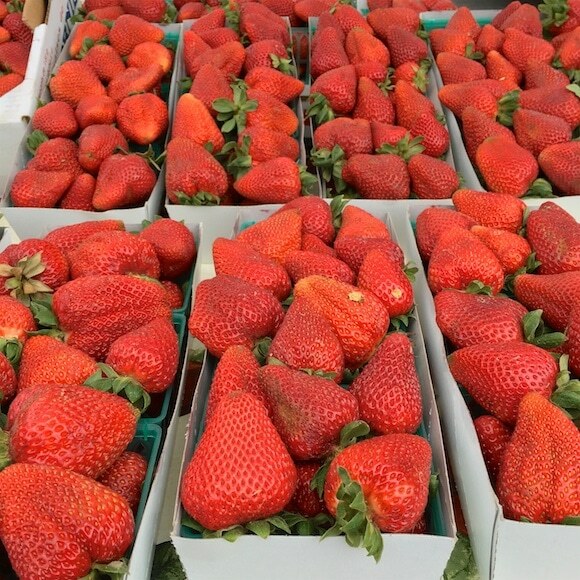 Try to find pesticide-free or organic versions, though, since berries are often sprayed with chemicals. 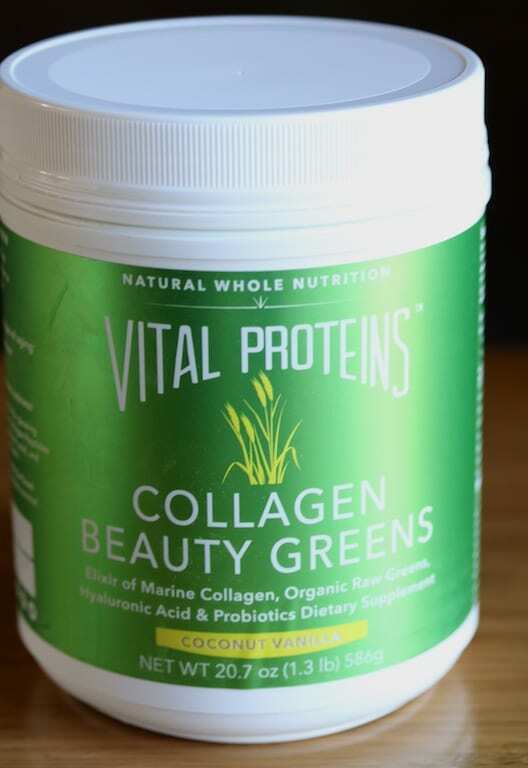 Another “in” product I love is the Collagen Beauty Greens from Vital Proteins. that’s made with marine collagen, along with raw organic greens, hyaluronic acid, and probiotics. I wrote about this product back in early 2016, but I’m updating this original post with new photos. Not familiar with collagen protein? It was new-to-me after I moved away from veganism and more toward a clean eating/ancestral approach (new readers can read about my journey here), but it’s basically an animal-based protein that has been broken down into a powder form. Most collagen products are made from a bovine source, but some come from fish products, too. Very pretty and tasty too! I’m including the recipe for the gelatin heats I made below the smoothie recipe. 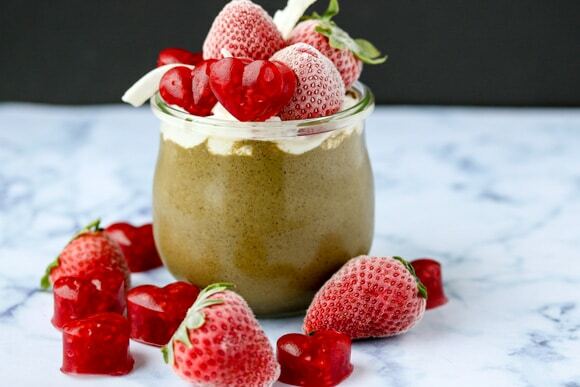 Combine strawberries, frozen banana, dairy-free milk, collagen protein, spinach, mint, lemon juice, cinnamon, cocoa powder, and raw honey into the base of a high-speed blender. Blend on high for about 20 seconds until creamy and smooth. Serve cold. Blendtec high-speed blender (refurbished now available)! Combine strawberries, gelatin, and water in a medium saucepan. Turn on the heat and bring to a gentle simmer. Use a whisk to ensure that the gelatin gets completely dissolved. Remove the saucepan from the heat and let cool for a few minutes. Stir in the honey. Pour the mixture into a silicone mold (I got this heart one online) or a glass baking dish and place in the fridge or freezer. It will take a few hours for the liquid to set into gummies. If you’re using a pan to set the gummies, use a sharp knife to cut them into squares. Store the gummies in a tightly sealed container for up to 3 weeks. I am so lucky to not have acne! My niece has had it for years (as an adult) and it drives her batty. I too have been pretty luck when it comes to acne. Washing my face in the morning and before bed is usually the only prevention needed. Sounds like a yummy smoothie! Interested to try the collagen & nice that there’s a “fish” alternative! I agree, I think it’s genius to have a fish alternative, but get all the benefits of the collagen protein. I did not have to deal with acne until I was in my thirties, thank goodness. It is less devastating then I think but still, adult acne is no fun! My only tip I’d really stress is not to pick at it, since that just introduces more bacteria to your face. It’s hard to let it be, I know! That’s a great tip, Deb! Thank you! Acne has always been an issue for me.. ???? Me too, Emily! My skin does fortunately respond well to salicylic acid, but I’d love to find even more natural treatments. I have been meaning to add collagen to my routine. I definitely struggle with acne so if you have any tips I am always looking lol. I recently added borage oil supplement to my diet as I read it can be beneficial for acne. Ohhh, the borage oil is a great suggestion! I’ve heard it’s good for PMS, too. 🙂 Honestly, I think the collagen has been helping my skin in terms of texture, maybe not so much with break-outs tho. Borage oil worked well for me when I had such wicked dry eye syndrome. I just started taking NeoCell’s Collagen Beauty Builder tabs, so this post really caught my eye. I definitely need to supplement and haven’t tried this brand yet. I had acne from my teenage years all the way to my forties. I cleaned up my diet (paleo/AIP) and started taking Great Lakes Gelatin (the green can) and my acne went away, along with my IBS. For the first time I have clear skin and love it. My son has acne really bad and we can’t figure out how to stop his. I love using apple cider vinegar mixed with water (1/4:1) as a natural toner! Its strong enough for acne, but it doesn’t wreck havoc on my sensitive skin! I have the Collagen Peptides, but mix them with something else for flavor, so I’d be interested in how the Coconut Vanilla flavor is with the marine collagen! I have no real good tip on acne treatment. I have tried sooo many things. Hydration, first of all. Regular enjoyment of fruits, veg, fiber-rich foods, and healthy fats, second. And, for me, as little makeup as possible! Thanks for sharing this — never tried! You’re welcome, Heather, and thanks for the tips! XO. Changing diet, no dairy has helped me, less alcohol, more water! Exercise and using less harsh products on skin. I love Vital Proteins! I use their collagen peptides in the blue bottle every single day. Maybe I should switch it up and use the marine collagen instead. Also interested in the beauty greens. Tried them at Expo West and loved them. I don’t often get acne but a good natural exfoliant is always helpful when the rare breakout occurs. Acne has always been an issue for me. A natural toner applied midday helps a little., and definitely having a balanced diet with minimal added sugars! I love the Mario Badescu Drying Lotion to spot treat, works pretty great! Would love to try one of these products in my smoothie. Thanks for the giveaway! I second Crystal’s recommendation on Mario Badescu’s Drying Cream. Several years ago I received a small vial sample of it and it still works! It has some sulfur properties I believe but use it now and then and pleased with it. They need to sell it in a smaller vial since I don’t use much over time and it will dry out (it’s no longer a cream for me, lol). Yes, I don’t throw out my old beauty items in a timely manner, I know!! I promise to do better, going forward! I’ll try that Crystal, thank you! Right now it is a paste and works OK like that. I seldom get a blemish but this does the trick if I do. I almost forgot I had it until you mentioned it so when I saw your comment, I had to chime in and concur! I try to keep my diet on track. I am allergic to corn and usually when I’ve accidently ingested I get a break out. Tea Tree oil dabbed on the spot can help. Lots of water with lemon. Welcome to Real Food Fridays – I think this is the first time I have seen you on our blog hop. I hope to continue to read your posts every week. Smoothies are always such a easy nutritious meal or snack. 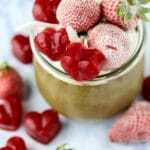 This recipe with fresh strawberries sounds so refreshing and healthy. Thanks for sharing on Real Food Friday! Pinned & tweeted! Oh, thank you so much Marla!!! I so appreciate the welcome and the sharing of my recipe. Looking forward to connecting with everyone on a weekly basis. XO. I just turned 40 and still dealing with acne! 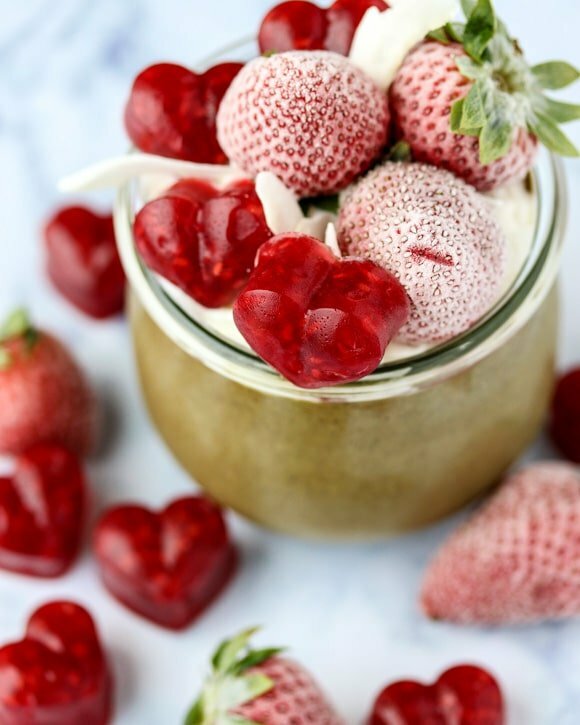 Love your smoothie and absolutely LOVE the gelatin hearts! They are adorable! 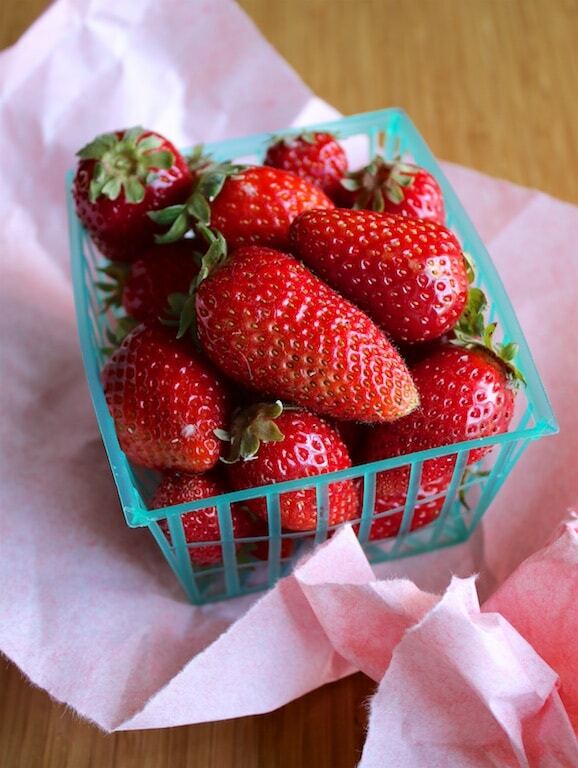 Strawberry season will be here in a few months in North Carolina. Definitely be trying this! Those berries look beautiful! I’m so excited they are coming back into season. I love the gelatin hearts, such a cute touch. I can’t wait to try this strawberry smoothie. I’m glad I found this recipe.